The most versatile pair of gardening gloves you will ever own! The right hand glove features claws that are attached, allowing you to work more efficiently and intuitively, while the left hand glove is clawless. The gloves are puncture resistant and the claws are made with durable ABS plastic to protect your ﬁngers and hands. Garden Gloves rinse clean keeping your hands dry and clean. 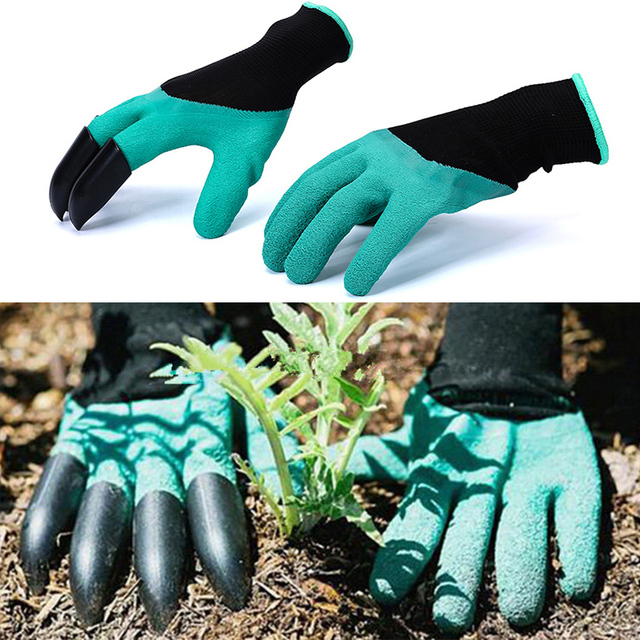 Garden the quick and easy way with Garden Genie Gloves. Gloves contain latex. 2 weeks shipping alone. Comfortable and seem useful. I like a lot, by that price are great. The size is for a hand adult, rather for men. Long Service, almost two months before permi. A dispute because the track appeared that the order is made, and I never got, wrote. He asked for a little more wait, what type of delay in customs, I dispute withdrew. And the goods is pleased at the well-made. Recommend. Order went almost 3 months to Tyumen. Made with high quality. Feels very nice and reliable, in fact not tested. Advice to buy goods. Workmanship good at first glance. Elastic good stretch. The hand of an adult male. Dooooolgaya delivery, buyer protection period expired when came. Goods was to Krasnoyarsk six weeks, Gloves look good, then check in. Thank you! Брала для бабушки, она и будет судья, пока ещё не отдала. На первый взгляд неплохие. когти только на одной руке, присутствует не приятный запах. nearly two package шла month. not отслеживалась. i have goods said medium. creepy воняют gloves. also not quality autumn forelock отвалятся quickly claws plastic. then look. whole gloves have, description as photo all-matched seller! ленинградскую shipping region. in 25 days, seller not consorted item arrival in china and trackable by your local post office. as normal is's, female so on hand. испытывались not more field.